Twilight is an Android app that automatically adjusts your device's brightness over the course of the day, reducing the harsh whites and blues as the day progresses. In other words, If you use your phone late at night or before you sleep, you really need this. Eye strain is a huge issue for those of us who spend a lot of time looking at screens, be it on TV, Desktop or smartphones. 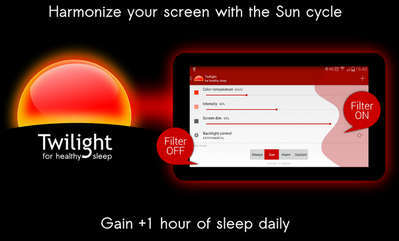 Improper screen brightness can hurt the eyes and make it difficult to sleep. Enter Twilight Pro, which works by taking your location (which can be set manually or detected automatically) and using sunrise and sunset times as indicators for dampening your screen. After sunset, Twilight will begin to dampen your screen’s color temperature using a combination of blue-light filtering and warmthy intensity. Thus helping you fade relax Eye strain and getting more sleep. The version of the app we have on Apktron is Twilight Pro that unlocks the Pro settings: custom sunrise time, custom sunset time, and custom transition time (the time it takes to fade from no-dampening to full-dampening when you hit sunrise or sunset times). Enjoy! Just install the app, that's it, no need for Twilight Pro Unlock 1.6 or anything else! If you need Twilight Pro 6.9, let me know! is it still blocked in India?! who are you referring to? !